Back before my hormones settled* and I became the level headed dame that I am I used to cry at a lot more books than I do nowadays. However, in the recent past I've cried at 2 books. No, this challenge didn't ask for 2 answers. But this is my space and I make the rules. So there. and Flowers for Algernon..well,I read it many years ago and later saw the film with Matthew Modine..terribly sad . Imagine in either of these stories... the hell of knowing that you are losing it, and not being able to do a darn thing about it.. 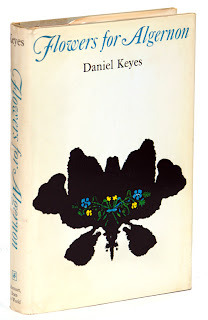 I've never seen the Flowers for Algernon film but I really should. Crow Lake and The Time Traveller's Wife. I bawled my head off at the end of both of those books. It was not a pretty sight. Crow Lake..I don't think I know of that! Once in a while I love a book to make me sob like a baby. It's cathartic I suppose? I'm going to keep my eyes open for that one! Marley and Me. That damn book had me balling throughout the last four chapters! Can you believe I've never read that?? 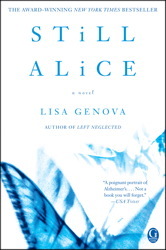 Ahhhh I couldn't wait to see what category Still Alice made for you, this is a great one. I haven't heard of the other. Night Road by Kristin Hannah had me last year. Still Alice also but it was so close to home I knew it would get me. Interesting... I cry much more now that I'm older.... maybe it's because the hormones are starting to get messed up all over again! :) The most recent book I've cried over was The Running Dream. Mostly because I felt for the parents in that book. LOL, good point Suey and probably very true! The Running Dream sounds familiar too. I need to look up everyone's tear jerkers! I cry during EVERYTHING!!!! One of the most memorable was reading Room by Emma Donoghue. I literally finished the book (not realizing it was the end since my Kindle said 93%) and burst into tears!